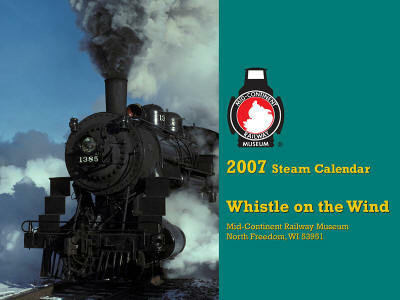 Mid-Continent Railway Museum has released its 2007 calendar, available from the Museum at P.O. Box 358, North Freedom, Wisconsin 53951-0358, for $7.95 plus $2 for shipping and handling. The calendar features 12 black and white photos, all but a couple vintage, of steam locomotives of the Chicago & North Western, Illinois Central, Fairchild & North Eastern, Chicago Great Western, Milwaukee Road and Soo Line. As MCRM has had no operable steam for a few years now, buying a calendar will help their efforts to return to proper historic motive power.